Thomas Carell started his academic career in chemistry at the Universities of Münster and Heidelberg. In 1993, he obtained his doctorate with Prof. H. A. Staab at the Max-Planck Institute of Medical Research. After postdoctoral training with Prof. J. Rebek at MIT (Cambridge, USA) from 1993 – 1995, Thomas Carell moved to the ETH Zürich (Switzerland) into the group of Prof. F. Diederich to start independent research. He obtained his habilitation in 1999. 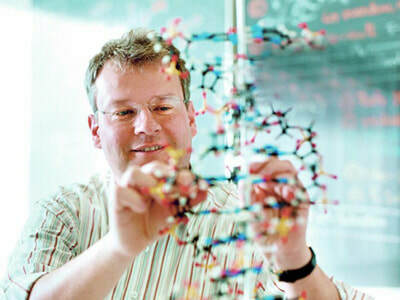 In 2000, he accepted a full professor position for Organic Chemistry at the Philipps-Universität in Marburg (Germany). In 2004, he moved to the Ludwig-Maximilians-Universität (LMU) in Munich (Germany) where he is heading a research group in chemical biology focused to analyze the chemistry of epigenetic programming in DNA and RNA. Thomas Carell is a member of the German National Academy Leopoldina and of the Berlin-Brandenburgische Academy of Arts and Sciences. He is the recipient of the Cross of Merit from the Federal Republic of Germany. K. Iwan, R. Rahimoff, A. Kirchner, F. Spada, A.S. Schröder, O. Kosmatchev, S. Ferizaj, J. Steinbacher, E. Parsa, M. Müller, T. Carell. "5-Formylcytosine to cytosine conversion by C-C bond cleavage in vivo." Nat. Chem. Biol. 2017, doi:10.1038/nchembio.2531. R. Rahimoff, O. Kosmatchev, A. Kirchner, T. Pfaffeneder, F. Spada, V. Brantl, M Müller, T. Carell. "5-Formyl- and 5-carboxydeoxycytidines do not cause accumulation of harmful repair intermediates in stem cells." J. Am. Chem. Soc. 2017, doi: 10.1021/jacs.7b04131. D. B. Bucher, C. L. Kufner, A. S. Schulter, T. Carell, W. Zinth. "UV-Induced Charge Transfer States in DNA Promote Sequence Selective Self-Repair." J. Am. Chem. Soc. 2016, 138(1), 186-190 doi:10.1021/jacs.5b09753. C.G. Spruijt, F. Gnerlich, A.H. Smits, T. Pfaffeneder, P.W.T.C. Jansen, C. Bauer, M. Münzel, M. Wagner, M. Müller, F. Khan, H.C. Eberl, A. Mensinga, A.B. Brinkman, K. Lephikov, U. Müller, J. Walter, R. Boelens, H. van Ingen, H. Leonhardt, T. Carell∗, M. Vermeulen∗. "Dynamic readers for 5-(hydroxy)methylcytosine and its oxidized derivatives." Cell, 2013, 152, 1146-59. T. Pfaffeneder, B. Hackner, M. Truss, M. Münzel, M. Müller, C. A. Deiml, C. Hagemeier, T. Carell. "The discovery of 5-formylcytosine in embryonic stem cell DNA." Angew. Chem. Int. Ed. 2011, 50, 7008-12.